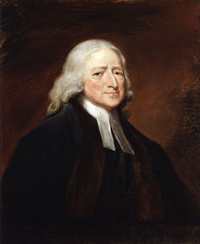 Many people know John Wesley was the inspiration behind the Methodist Denomination. 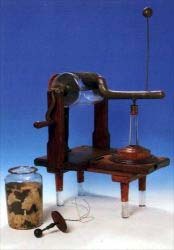 But few know he was one of the first persons in England to use a static electricity machine to heal many disorders including blindness, gout, sprains, deafness, toothaches, and stomach and back pain. Wesley wrote in his book, Primitive Physick, that electricity is "the nearest an universal medicine, of any yet known in the world." Primitive Physick, first published in 1747, was an inexpensive guide to simple, safe and effective cures. It contained 900 recipes and cures for 288 afflictions. The book was so popular that it continued to be published through 32 updated editions. Methodist circuit riders carried this best-selling health guide in their saddlebags. In it, Wesley recommends electricity as a cure for over twenty illnesses. It was one of his favorite remedies and he says it is "far superior to all the medicines I know." John Wesley practiced medicine without a license from the medical community. He did it because of his compassion for the poor and chronically ill in London who could not afford medical treatment. He opened the very first "free clinics" in England. He advocated cold water baths, hot poultices, herb teas, warm lemonade and hygienic measures. But over the years, he was most impressed with the results of electric treatments and went on to write a book dedicated to healing with electricity. In November, 1756, he obtained an electrical apparatus and began experimenting by shocking himself for lameness and neuralgia. The cure was certain but gradual. His Journal records at least two other occasions where he applied electrical shock therapy to himself, once when he was 70 and once when he was 80 years old. In 1773, while on one of his many preaching tours, Wesley had such a pain in his left side and shoulder that he had great difficulty even lifting his hand to his face. For several days previous he had been trying to recover from inflammation in his throat and mouth. He felt that the pain in his side and shoulder was a result of the earlier inflammation. After getting one of his assistants to electrify him, he felt much better and was able to preach in the evening. Ten years later he was electrified for cramp. Three months earlier he had contracted a cold while riding in an open chaise from one preaching appointment to another. This had resulted in a deep cough which would not dissipate. He tried to keep preaching but became very weak and was sent to bed. After a night of rest coupled with some vomiting he felt better and set out for another town. Shortly after his arrival, he became feverish and had to lie down. His chest became tight and he experienced some violent cramps in his legs. He convinced a friend to electrify him in the legs and chest several times a day. A few days later he had no more fever, tightness in the chest, or cramps in his legs and was able to resume preaching. These examples indicate his personal experience and confidence in the method. It consists of a hollow glass cylinder (7 1/2 in. long by 4 1/2 in. diameter) supported on two wooden uprights. Through it runs a metal bar to which a handle is attached, by means of which the cylinder can be freely rotated. A leather pad (to which is firmly attached a piece of black silk) is pressed against the cylinder. It is controlled, very simply, by a thumbscrew. On an attached platform (8 in. long by 5 in. wide) and mounted on a glass insulating column, is a metal arm with a thin rod (9 1/2 in. long) attached to it, at the end of which is a small metal ball 1 in. diameter. The whole machine is mounted on four glass insulating legs (4 1/2 in. in height). Presumably the patient caught hold of the ball and as the metal arm made contact with the rotating cylinder, got a shock - the intensity depending upon the vigor with which the handle was turned. Two or three years after, our patients were so numerous that we were obliged to divide them; so part were electrified in Southwark, part at the Foundry, others near St. Paul, and the rest near the Seven Dials. The same method we have taken ever since; and to this day, while hundreds, perhaps thousands, have received unspeakable good, I have not known one man, woman, or child, who has received hurt thereby. His "electrifying" cures were so successful that he wrote another book, published in 1760, "The Desideratum," on the application of electricity to medicine. He lists 37 disorders where electrifying has been of unquestionable use. He observes, "a great part of these are of the nervous kind and perhaps there is no nervous distemper whatever which would not yield to a steady use of this remedy. It seems, therefore, to be the Grand Desideratum in Physic from which we may expect relief when all other relief fails." Anne Heathcot...was seized, in May last, with what is commonly called an "Ague in the Head, having a violent Pain in her Head, Face, and Teeth. After trying abundance of Remedies, to no purpose, she was, in August, electrified thro' the Head. Immediately the Pain fix'd in her Teeth. She was electrified four Times more, and has felt nothing of it since. William Jones, a Plaisterer,...fell from a Scaffold on Thursday, Feb. 15 last. He was grievously bruised, both outwardly and inwardly, and lay in violent pain utterly helpless, till Saturday in the Afternoon, when he was brought (carried) by two Men to be electrified. After a few Minutes he walk'd home alone, and on Monday went to work. A young Lady had been affected with Fits near seven Years, which seized her without any Warning, and threw her flat on her Face, quite insensible. These frequently returned twice in a Day. This was attended with almost continual Coldness in her Feet. Her Stomach also was much affected. She stood upon a Wire coming from the Coat of the Phial, and to complete the Circuit, another Wire was laid upon her Head, by which means the Fire was conveyed to that Part. By this Means both the Fits and Coldness were gradually removed, and a complete Cure effected. E- T- taking cold, was seized with a sore Throat, which grew worse and worse for six Days. She then could not swallow even a Bit of Bread soaked in Tea. The same Morning she was electrified, so as to direct the Shock in a right Line thro' the Part affected. By the Time she got home she could eat any Thing. Two shocks more made a perfect Cure. Sarah Guilford, aged 37,...was for upwards of seven Years so afflicted with Rheumatism in her right Side, that the Knee and the Ankle were wasted exceedingly. January 2d last she was electrified, and perfectly cured in one Ray. But it threw her into a profuse Sweat, particularly from those Parts which had been most affected. A person had rigid Knots in the Thigh like what appear in violent Cramps, but not so hard or painful. These were entirely dissipated in a Minute or two, only by drawing sparks. One at Upsal, who had lost the Use of his Limbs from Cold, for several Years, was in some Weeks quite restored. Abigail Brown, aged 22,...was from a Child frequently afflicted with a violent Head-ache...she was electrified five Days successively, having one Wire applied to the fore Part, another to the hinder Part of the Head, and receiving seven or eight Shocks each Time. Hereby she was entirely cured, nor has found any Pain in her Head since, unless occasionally for want of Sleep. A Man, fifty-seven Years old, who had been deaf for thirty-two Years, was so relieved in a few Days, as to hear tolerably well. It seems the Electric Fire in Cases of this kind and of many other Kinds, dilates the minute Vessels, and capillary Passages, as well as separates the clogging Particles of the stagnating Fluids. By accelerating likewise the Motion of the Blood, it removes many Obstructions. Wesley implies in his book, Desideratum that electricity was "the thing to be desired." He called electricity the "soul of the universe." This great machine of the World requires some such constant, active, and powerful Principle, constituted by its Creator, to keep the heavenly Bodies in their several Courses, and at the same Time give Support, Life, and Increase to the various Inhabitants of the Earth. We know that the Creator of the Universe, is likewise, the Governor of all Things therein. But we know likewise, that he governs by second Causes; and that accordingly it is his Will, we should use all the Probable Means he has given us to attain every lawful End. The "second Causes" Wesley mentions is the ongoing discoveries made about using electricity for relieving the pain and suffering of mankind. He felt these were the laws of God which were intended to be used for "every lawful End." I do not know of any remedy under heaven that is likely to do you so much good as the being constantly electrified. But it will not avail unless you persevere therein for some time. Wesley believed that the emotions of the mind are capable of bringing about changes in the body. When the mind experiences disturbing emotions, the whole body responds in 'sympathy.' "The passions (emotions) have a greater influence on health than most people are aware of. All violent and sudden passions dispose or actually throw people into acute diseases. Till the passion, which caused the disease is calmed, medicine is applied in vain," wrote Wesley in Primitive Physick. Health is preserved by a sensible regimen (manner of living) and the faithful use of that old fashioned medicine called prayer. The medical men despised Wesley and his work. Their contempt was probably due to the fact that Wesley was not properly qualified, did not charge for his services, and was hugely successful. As an itinerant preacher, he was maligned for practicing medicine and especially for using electricity. In the December 1760 London Magazine he was challenged, "Why do you meddle with electricity?" Wesley replied, "for the same reason I published 'Primitive Physick' - to do as much good as I can." He said that if society had to wait on the physicians to try electrical healing, society would wait in vain. Physicians were too committed to making money by prescribing complex medications for which they charged much money. Before I conclude, I would beg one Thing (if it be not too great a Favour) from the Gentlemen of the Faculty (physicians), and indeed from all who desire Health and Freedom from Pain, either for themselves or their Neighbors. It is, That none of them would condemn they know not what: That they would hear the Cause, before they pass Sentence: That they would not peremptorily pronounce against Electricity, while they know little or nothing about it. Rather let every candid Man take a little Pains, to understand the Question before he determines it. Let him for two or three Weeks (at least) try it for himself in the above-named Disorders. And then his own Senses will show him, whether it is a mere Play-thing, or the noblest Medicine yet known in the World. John Wesley's chief occupation was saving souls but he had an important sideline - saving bodies. Wesley made a tremendous impact on England's poor who were chronically sick and unable to afford a doctor. He was extremely sensitive and compassionate toward the needs of the downtrodden. Besides prescribing plain and simple remedies for physical illnesses in both the Desideratum and Primitive Physick, Wesley is credited with speaking out against slavery, debtors' imprisonment, poor working conditions, and unsanitary living conditions. John Wesley not only preached, he actually ministered healing and salvation both in London and on his many long journeys. His own strong faith and His godly example had as much to do with the spread of 'Primitive Physick' throughout eighteenth century Britain and America as did the remedies imprinted upon its pages.